I have to say that bamboo charcoal is just such a wonder substance it’s hard not to sound over the top when talking about it. It’s long past the point where it’s in all of our vehicles, every bag or purse, and the bathrooms. My kids all know how to use it and advise their friends. So lets go through some fast and fabulous ways to use the Black Gold. It’s all about surface area. Charcoal works through surface area. 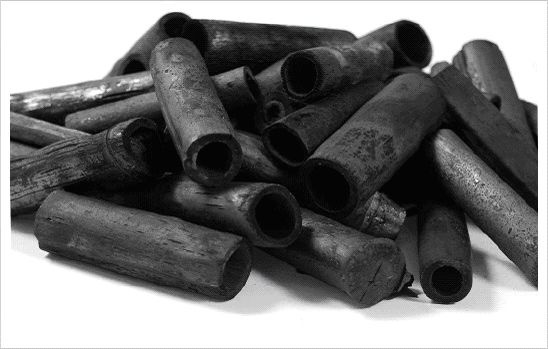 The charcoal binds to toxins and pulls them from the body or water and holds them in place. The more surface area there is the more area there is to bind to. The process is called adsorption quite different from absorption. Absorption is what a sponge does, water is taken into the sponge. Adsorption is where the atoms adhere to the surface of another material in this case charcoal. Charcoal does this electrostatically which in general means it adheres to substances poisonous to life. Activation of charcoal increases the surface area so that one tsp of activated charcoal can have up to one football field of surface area. The structure of bamboo allows for more surface area when creating charcoal because of the system of tubes that make up the culm of the plant. In addition Black Gold is ground to a fine powder which further enhances the potency. That is the basics so now onto it’s numerous uses. Charcoal is phenomenal at removing toxins from the body and has been used in drug and alcohol overdoses for years. There are two different ways to go about using it for getting rid of toxins including heavy metals. One is take 1-3 tsp per day a couple of days a week. The other is to do the same thing but everyday for up to a month then stop for a couple of months and repeat. I tend to do both. I like to switch up my nutritional supplements using them a lot for a while then switching to another supplement then coming back maybe for a few days and so on. Charcoal can be dehydrating and it is important to drink a lot of water when taking it. Start with 1/2 tsp to see how your body reacts then work up to 3 tsp. Some people experience constipation and using soluble fiber like Bamboo Leaf Tea or chia can help. Chaga is also a great tea for helping with digestion and works best as a tea. Again don’t panic the charcoal will flush through your body so your bowl movements will be black. I have used charcoal for food poisoning many times and it works! The best way is to take 1/2 tsp as quickly as possible. Take another 1/2 tsp in 15 min if the nauseous feeling has not subsided. You may also throw up which is the body’s way of getting the toxin out. I have a sensitivity to MSG and if I eat something with it in it I can feel the effect within 10 min. I will then take charcoal and within another 10 minutes all of the symptoms have subsided. Mix one tsp of charcoal and a pinch of sea salt in 1/3 cup of warm water. Use this to gargle with. Soar throats can be viral or bacterial and charcoal has been shown to help with both. It alleviates pain and helps to reduce inflammation. Upgrade with oregano or basil essential oil. Alcohol and fried food make for the worst combination in your system. While avoiding overindulgence is best charcoal is here to help. Take 1-2 tsp at night and then repeat again in the morning. Lots and lots of water will be required to flush out the system because the alcohol, bad food, and charcoal are all dehydrating. This really works! I had plenty of customers at my Sunday market who would stop by in the morning to get their fix after a late Saturday night. This is my kids favorite use. We love to go barefoot and live in an area where there are lots of biting ants. We keep a small container handy at all times with this mix: 1 tsp charcoal, a few drops of oil or coconut oil, and enough water to make a paste. You will need to add water as the mix will dry out over time. This can be applied with a finger or a q-tip. If you put a band aid on it the charcoal won’t stain your clothes ect. plus it keeps the moisture in which activates the charcoal. This can also be used for snake and spider bites as well as bee stings and leaches. For snake bites or many ant bites make a charcoal bath by mixing 1/4 cup of charcoal per gallon of water and immersing the area affected. This will draw out the toxin. Upgrade with lavender, tea tree, and/or clove essential oil. Poultices have been used for thousands of years because they work. Charcoal has been shown to work externally even on internal problems. It can detox an area of the body and reduce inflammation. The simplest way to make do this is mix the charcoal powder and water together so that it is a paste and not too watery or it won’t stick to the skin. I like to add a bit of oil to keep the mixture moist. Charcoal works when it is moist so this is important. This basic recipe can be upgraded by adding in essential oils, clays, teas, and other healing remedies. Coat the area of skin with the paste and then cover with wet paper towels or wet napkins. Wrap the area in plastic wrap or towels to keep the moisture in. This can be applied to the feet for detoxing as well as the face for acne. Leave the mixture in place for 1-8 hours and repeat as necessary. This will both reduce any pain as well as aid in healing the body. Upgrade with frankincense, tea tree, clove, or eucalyptus essential oils. Charcoal is great for ridding the face of acne or other blemishes. Charcoal soaps are an easy face remedy for acne and I make mine with that intention. To make a mask mix 1 tbs of charcoal with 1 tbs of aloe vera gel, add water if needed. Apply to the face and leave on for 5-30 min. Wash off with warm water and apply aloe directly to the skin for a moisturizer that won’t clog the pores. To upgrade this add turmeric powder or clay to the mix, then a floral water or tea like Bamboo Leaf Tea or chamomile, and finally an essential oil like lavender and frankincense for normal skin, geranium, chamomile, and jojoba oil for dry skin, or tea tree or juniper berry for problem skin. Be very careful applying essential oils to the skin they can burn especially on the face. Tea tree and juniper berry are the harshest so start with one drop and test it before putting the mask on. Charcoal can be used to make an organic eyeliner by making a simple paste of charcoal and water. Just like the Egyptians used to do. Charcoal is the best for getting rid of unwanted odors and moisture. This can be used in the refrigerator or freezer, or in a closet. It can be reactivated by placing the charcoal in the sun for a day. After several times of doing this simply add it to your favorite plant or lawn for an upgraded fertilizer. Plants love charcoal! Upgrade with your favorite essential oil. Mix 1 tsp of charcoal with water to make a paste an upgraded version of this includes aloe vera. Another way is to apply the charcoal paste and then cut aloe so that the gel part is exposed on one side and the skin on the other. Use this as a bandage over the charcoal paste and leave in place for as long as possible. For large areas a cold water bath with charcoal can be made. Lavender is the essential oil used most for burns. If the wound is wet or weeping the charcoal can be applied dry and let the moisture of the wound absorb it otherwise make a simple mixture using water. Clean the area and redress 1-3 times a day. Charcoal has been shown to reduce and often eliminate infection. When we are in Costa Rica any scratch or open area of skin quickly gets infected. We have learned to immediately apply a charcoal paste to all cuts ect. to avoid the inevitable infection and aid the body in healing quickly. Upgrade with lavender or tea tree essential oil. I don’t recommend this for light colored hair. Charcoal can be added to shampoo or conditioner for an upgraded hair detox. Sprinkle a small amount of powder into the shampoo or conditioner and leave on for 1-10 minutes. Rinse thoroughly. Another version is add 1/4 tsp, 1/4 cup of apple cider vinegar, and 4 cups of water, mix and apply to the hair. Rinse. Upgrade by using teas in place of the water. Bamboo Leaf Tea is great for this application. This works well for stripping chemical or other build ups on the hair such as those from well water. Charcoal is a must when trying to get a handle on candida. The charcoal will aid in both reducing the growth of yeasts in the gut and help to eliminate the toxins from die off of yeast. Mix the charcoal in a pudding like substance such as a chia pudding, yogurt, applesauce, or smoothie. Charcoal can be added to baked goods or foods as long as you are ok with them turning black. Great for a Halloween detox. Poultices are really effective especially a bit warm. Mix charcoal 1 to 1 with flax see meal or chia add 1/4 cup of warm water and let gel and apply to area. Bread, oatmeal, four, corn meal can all be substituted as a binder for the poultice. Upgrade with aloe gel. Bathing in charcoal is a great way to detox the body or just a problem area. Mix 1-2 cups in a warm bath and soak for as long as possible. The clean up is worth the results! Upgrade with your favorite essential oil.